Now lets take a further look at how we communicate with each oher. Establish relationships and make friends. Exchange information, communicate ideas and give directions. Develop thinking skills e.g. help us to remember, make plans, solve problems. Become happy and successful members of our community. If you try to talk to someone with your mouth full of food, or while holding your tongue in your cheek, the other person will find it difficult to understand you. And it will also be difficult for you to make yourself understood. Or to express yourself. In a child with cerebral palsy, this cycle often breaks down. 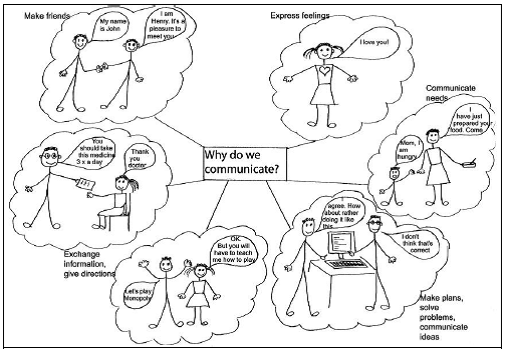 Why would a child with cerebral palsy may have difficulty communicating? understanding. 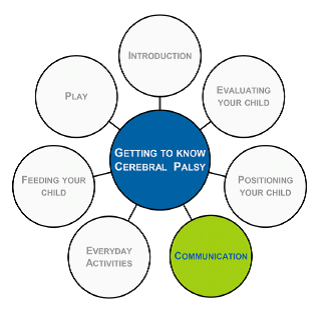 Keep in mind that children with cerebral palsy may have difficulties with some or many of these. The more areas that a child has difficulties with, the more severe the communication problem will be. Let's look at where it breaks down. Will have difficulty with both steps -- understanding and expressing. How much difficulty depends on the extent and areas of damage in the brain. Will not have difficulty with understanding. If she can talk, she will be able to express herself, though it may be a bit unclear. If she cannot talk, it may be difficult for her to express herself and very often she is then labeled as having an intellectual disability. She will need to be taught and encouraged in other ways to express herself, otherwise her communication cycle breaks down. Communication skills develop according to a sequence of steps. From birth the baby expresses herself using sounds (e.g. crying) and facial expressions. To encourage the child to interact, it is important that she learns to make and maintain eye contact. At first she may only look at you briefly but later she may be able to keep eye contact for longer. Babies are initially more interested in faces and then later in objects. She learns about taking turns when her mother responds to her sounds. She may start to coo and gurgle when talked to and may later be able to repeat sounds and gestures. Observe for gestures / sounds that she may use to express herself, and respond consistently and immediately to any attempt she uses to initiate communication. This will encourage her to communicate. As her understanding improves she will start to respond to simple commands. Give your child choices during the day. This can increase her motivation to let you know what she wants. 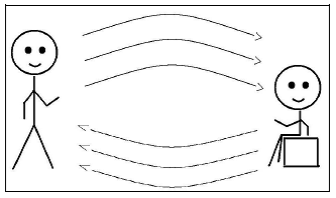 For example, let her choose between two different tops/pants or skirt when dressing her in the morning. You could also let her choose whether she wants something to eat or something to drink first at a mealtime. Listening and understanding comes before talking, as we can see from the chart. Learning that prepares a baby for speech begins early, long before she says her first word. We know that most children with cerebral palsy can hear, so they listen to the words you say and in time (usually) they begin to use words themselves. Babies need to learn to chew to help develop control of the movements of their tongue, cheeks, and lips. This is very important for the development of talking. (Many children who have difficulties controlling their tongue and mouth often get given ONLY soft food -- so they never really practice using their mouth and tongue). Important: Make sure you attend to any sign of earache in your child. If left untreated, this could lead to ear damage and loss of hearing. Remember in the first training module we mentioned that children with athetoid type of cerebral palsy often have hearing loss which could require use of a hearing aid! Children with cerebral palsy will often need to use another way of communication to support speech, or instead of speech. 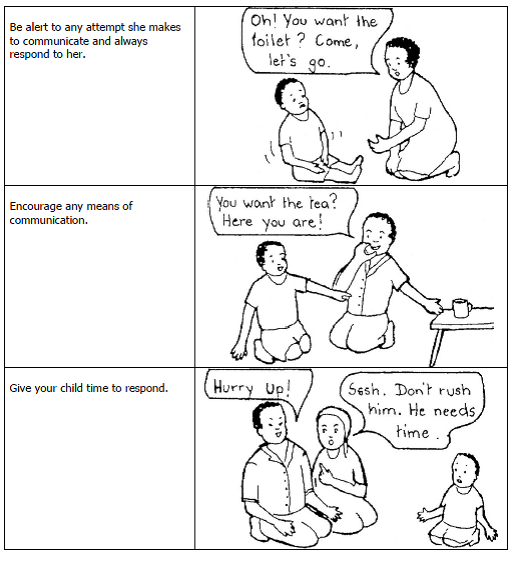 At first, all young children with cerebral palsy should be helped to develop ALL methods of communication. As they get older, if it becomes clear that speech will be their main way of communicating, then concentrate on developing their speech. Talking (speech) is their easiest link with other people. However, for many children with cerebral palsy it will become clear that spoken language will NOT be their main way of communicating. So we must concentrate on helping them to develop their skills in using other ways to communicate, such as picture boards, communication boards, signing, gesturing, or written language. Making signs or gestures using the hands, arms and face to communicate a message. Pointing to people / objects with her eyes or hands to communicate. Pointing to pictures displayed on a chart to communicate a meaningful message. 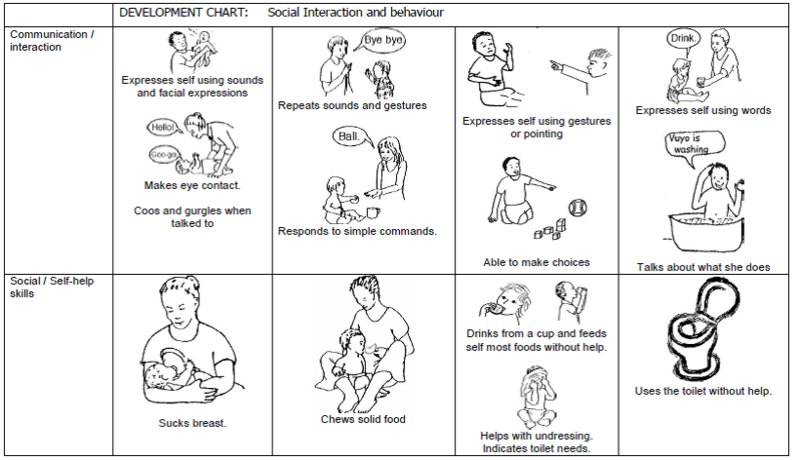 It is important to encourage children with communication difficulties to be able to indicate their basic needs, so that they can become more independent. Ideas to encourage her to express herself using sounds, gestures or facial expressions. Talk to your child about what she needs or wants you to do for her. 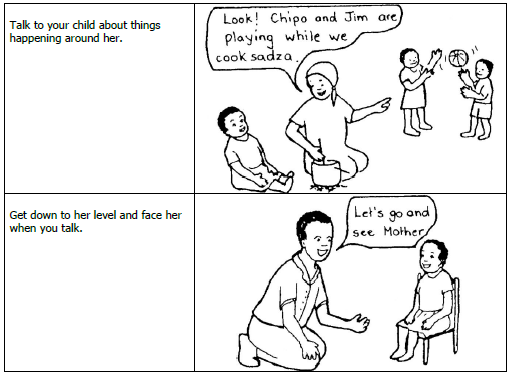 Ask her to show you how she indicates some of her daily needs such as " I am hungry‟, "I am thirsty‟, "I want to rest‟, " I am cold‟, and then practise these together. Encourage her to indicate "yes‟ or "no‟ if you ask her if she is hungry, or thirsty. Try to understand what she means when she uses sounds, facial expressions, body movements or gestures. Show her how to make gestures, and help to make them by moulding her hand(s). It is important to respond immediately to any attempt she uses to initiate communication. person. Later ask her to point to pictures only. need. Other may have a big collection of pictures to use for quite complex communication. Pictures can include social expressions, people, things, actions, feelings, daily needs. We would encourage a child to use other methods of communication when a child has difficulty getting her message across using speech, and especially when she is frustrated by her struggle to get her message across. If you think your child needs to use gestures of large pictures to communicate you should: discuss this with your therapist or doctor. Ask for a referral to a speech therapist who can help to assess your child and decide with you and your child which communication method is best. 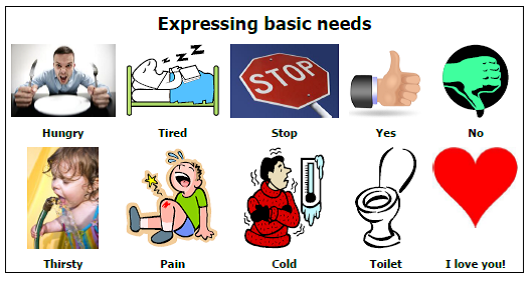 Thespeech therapist can also help to design a communication board that would best suit your child's needs. Only repetition and consistency will help her to learn this new way of communicating. If people do not respond to her efforts to communicate, she will not be motivated to use it. Hold your face close to your child‟s face and talk to her. Try to encourage her to look at you. Call her name; when she looks at you, praise her by smiling and talking. Use lots of facial expression. Sing songs to her. She will enjoy the rhythm. Ask her to look at different objects. Shiny objects such as a chip packet turned inside out will draw her attention. You can also use every day objects with different textures or sounds. Let her play and explore objects. Talk to her about the different objects. When she makes a sound, uses a facial expression or body movement; copy her and then take turns „talking‟. Respond immediately to any attempt she uses to initiate communication. Clap your hands and then ask her or help her to clap her hands. Hold a ball in front of her; ask her to wait, and then to hit the ball. Play music on the cell phone. When it stops, wait for a response from the child before switching it on again. Give her a choice of things to play with or to eat. Show her the things where she can see them best. 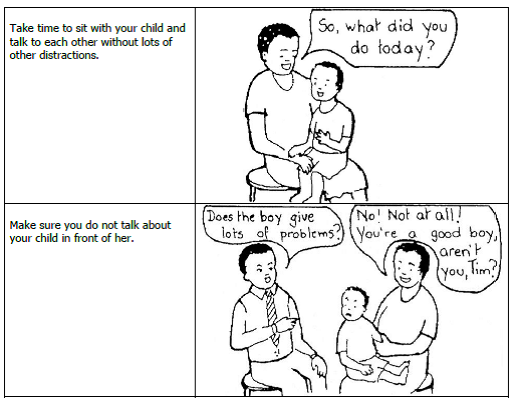 Making choices is important for children who are beginning to learn ways of communicating other than speaking. 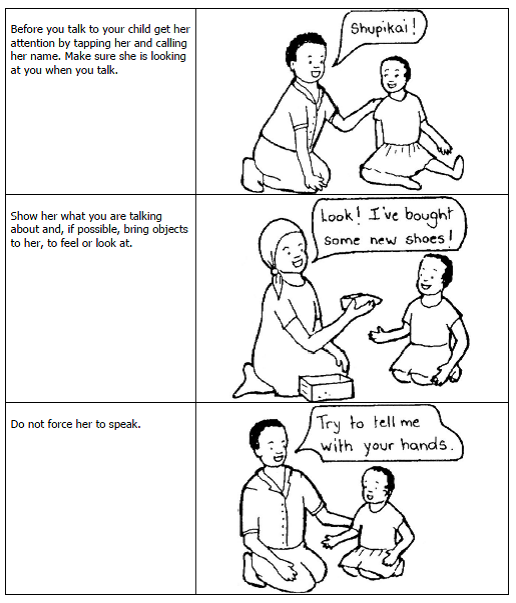 You can teach her different categories for example body parts, animals; food; objects in the house; people they know. Disabled Village Children – A guide for community health workers, rehabilitation workers, and families, David Werner, The Hesperian Foundation, Berkeley (1999). 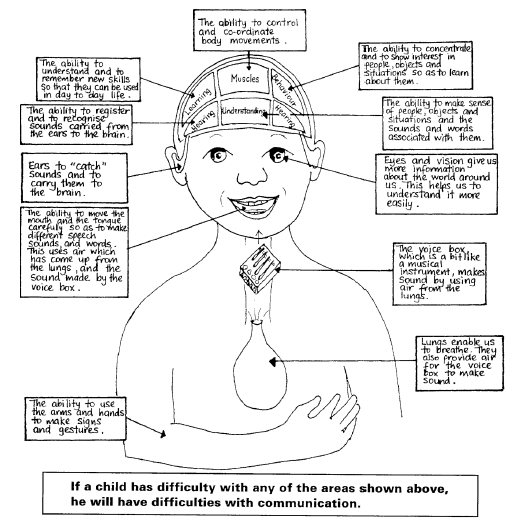 Promoting the Development of Young Children with Cerebral Palsy – A guide for mid-level rehabilitation workers, World Health Organisation, Geneva (1993). 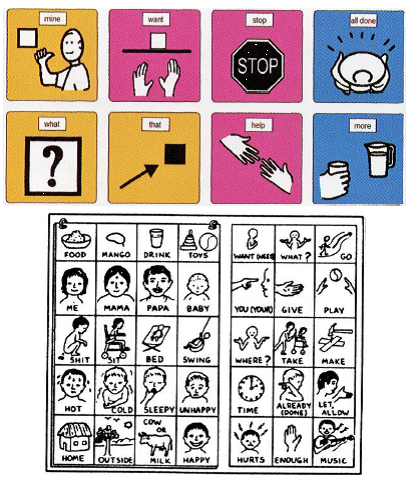 Let's Communicate – A handbook for people working with children with communication difficulties, World Health Organisation, Geneva (1997). Community Based Rehabilitation -- Training and Guide, World Health Organisation, Geneva (1989). Cerebral Palsy, ga se boloi (it‟s not witchcraft), Physiotherapist Department of Gelukspan Center, Reakgona. Polokwane Hospital CP Group Manual, Polokwane Hospital. Community-Based Rehabilitation Workers – a South African training manual, Marian Loveday, SACLA Health Project, Cape Town (1990). Foden Manuals 1-4, Foden Centre, East London (1999). Learning for Life, Masifunde 2002, Staff Development Special Care Centres, Cape Mental Health. The Education of Mid-Level Rehabilitation Workers, World Health Organisation, Geneva (1992). Disability Prevention and Rehabilitation in Primary Health Care – A guide for district health and rehabilitation managers, World Health Organisation, Geneva (1995). Disability Prevention and Rehabilitation – A guide for strengthening the basic nursing curriculum, World Health Organisation, Geneva (1996).